Towards the end of our stay in Tunisia we were wishing we hadn't made so many reservations made for Sicily--we longed to head to Germany for a little R&R instead. Yes, Germany would still be under the grip of its winter chill, but it is such a reassuringly comfortable place for us to be. We fantasized about being on a lovely river where the sidewalks would be swept clean, the open spaces would be well-kept, and the old village centers would ooze with charm. A visit to well-kept Germany would be welcome after Tunisia. There had been nothing charming or pretty about Tunisia and we longed for the sense of well-being that charming and pretty create in us. Sicily would be a step-up from Tunisia, but "charming and pretty" aren't common descriptors of southern Italy based on our experience. Sicily would be more familiar; it would be more comfortable; but it wasn't the perfect antidote to the jumbled feeling from being in unpolished Tunisia. We were quite surprised however that even in our first minutes on the busy streets of Palermo that it was good enough, we could immediately feel that it would be a sufficient antidote to Tunisia. Tunisia wasn't as jarring as Egypt had been a few years earlier and our Tunis hotel had made for a comfortable last night in the country. And we'd spent the day of our evening sail on an outing to a prettier stretch of coastline in the 'burbs of Tunis. "Why?" kept going through my mind. "Why do we get so jarred?" "Why is Palermo an antidote?" In many ways Palermo is just as jarring as Tunis, so what is the difference in how these 2 places make me feel? In both Palermo and Tunis we found the side streets where men were prematurely destroying their bodies by pounding away at sheet metal to make things that are rolling off a manufacturing belt elsewhere. In both Palermo and Tunis we and other pedestrians fought for a place in the streets when the sidewalks were overtaken by merchants or cars. The people of Tunisia live under the oppression of a strong-man government; the Sicilians and many other Italians live under the oppression of the 'State within a State', organized crime. In both countries we saw people hauling water to their homes from a public spigot. In both countries there are people living in very substandard housing. In both Sicily and Tunisia people smoke incessantly with no regard for the unwilling second hand smokers around them, including their children. And in most of Italy and Tunisia, men rip around on motor scooters making deafening squeals and roars. In both areas there seems to be a backwardness about taking care with one's body, taking care with one's health. 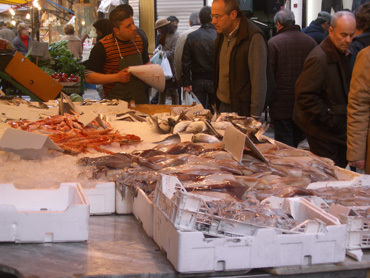 Food in Palermo was fresher & more varied than in Tunis. But in Palermo the substandard housing likely once was a lovely villa that has declined due to lack of maintenance; in Tunisia the inadequate housing never was nice. In Palermo, the clip-clop of horse-drawn carriages are a tourist novelty; in Tunis the hoofs are of donkeys drawing carts loaded down with building blocks or hay. In Palermo the vast stalls of street vendors were selling deeply discounted new clothes and shoes; in Tunisia the same scene was for used clothing and shoes. In Palermo's open-air market all of the produce was fresh and lovely; in Tunis much of it was past its prime. I'm now guessing it is the larger middle class presence in Palermo and Europe that makes them more comfortable places for me to be than in Tunisia or Egypt. It is being around more people doing what I am doing, living the way I live, thinking the way I think, that makes some places feel more welcoming and more safe. In Italy, people often stare at our sandals in disbelief; in Tunisia people stared at us from head to toe and laughed. In Italy and Europe we are in foreign places but they aren't as foreign as North Africa. Of course, it is the foreignness that draws us, that fascinates us, but it is also that which wears us down. We like it best when our position on the 'foreignness scale' is changing and isn't stuck in the same place, when we are neither bored with sameness or battered by contrasts. Additionally, in Tunis we occasionally saw women wrapped in their creamy white lengths of fabric or other obscuring garb, which for me were unwelcome symbols of oppression. Perhaps for them it is a comfortable part of their past brought forward in time, but for me it speaks to the belief set that holds women out as evil, as less entitled. In Europe such symbols of women's historical oppression are worn by the immigrant women, not the local population. Her obscuring garb on the continent speaks to the culture she is from, not the culture she and I are currently in. On the continent I view the sight of Islamic dress code for women as an anomaly, not as an indicator of the general status of women. So, after having had fantasies of heading farther north to Germany from Tunisia, we quickly discovered that we were surprisingly content to be in Sicily, to be in Palermo. We could get our needed recovery from our North African culture shock while we continued with our plans for a brief stay in Palermo. Actually being back in Palermo itself on the heels of reading a book that was in part about the mafia (Midnight in Sicily) was sobering. "Oh my god, I didn't realize it was in the heart of the city: the notorious prison where one jailed mafia boss spent $20,000 per month on food in his carpeted cell". "Right there--that's the hotel where some of the meetings were held." "These must be the apartment buildings the mafia built during it's 1960's construction spree." "Could that be a mafia scout posted at the alley entrance Bill decided not to enter?" "How many of these little businesses are paying protection money, 'pizzo'? All of them?" As we walked and walked the back streets it was easier to make sense of what we were seeing than when we were in Palermo last fall. 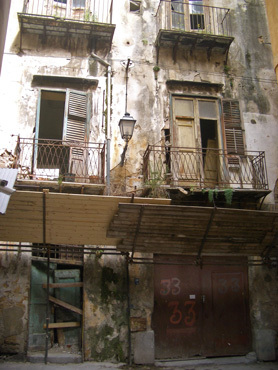 Some of the trashed buildings were probably left over from WWII damage and those and many, many others had been denied the renovation funds diverted by the mafia. Since the war, Italy's central government and now the EU have funneled millions, if not billions, of dollars into Sicily, into Palermo, to stabilize its structure and infrastructure but it's a wreck. Last visit we wondered why; this visit we were pretty sure we knew the answer. Occasionally we'd spot one newer window and a TV antenna on the top floor of a derelict building, a building that was otherwise windowless and in shambles. On several of these more regrettable streets, only blocks from the fashionable thoroughfare, a father and his 2 daughters would be filling containers with water from a rare public tap. In some areas, building after building would be shored up by scaffolding and makeshift canopies of corrugated steel would protect pedestrians from collapsing bits of old buildings. 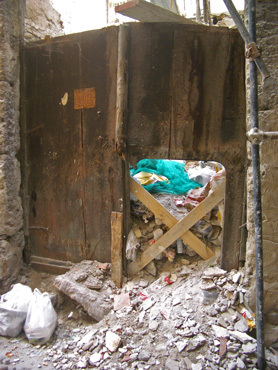 The decaying guts of some of the buildings were spewing into the passageways and became magnets for garbage. Seeing the chaos at the sidewalk level made it appealing to soon be leaving Palermo for Tràpani but then I remembered what else I had read. Tràpani, where we stashed our bikes and joked uneasily about them still being there when we returned, was near the site of one of the biggest heroin operations for the Cosa Nostra. Tràpani and Marsala that we visited last fall were no longer in my memory for their Phoenician and Roman heritage, but now for their place in the modern history of heroin on the island. It also reminded me that the first mafia victim's memorial we saw in Brindisi was for Falcone, one of the most heroic crusaders in recent years that was cut down by the Palermo mob in Palermo. Organized crime is on the rise and probably blankets the earth, but it was still creepy being in Sicily, probably one of longest and most deeply contaminated areas. In Tràpani a few days later, we noticed a bike shop with a half dozen bikes displayed on the sidewalk--none with locks. "Must be paying their protection money" was Bill's comment, which made sense to me. One bike shop in Portland keeps all the bikes indoors locked 24 hours a day. It's hard to imagine that the difference is just a matter of cultural integrity as it was in our Tràpani hotel that we had trouble with housekeeping repeatedly pilfering our chocolate bars. It started with the staff boldly opening a wrapper and snapping off a corner; the next day an entire bar was missing. Guess we should have been paying protection money--or maybe we were. We only briefly pondered as to whether to comment to the hotel host about the chocolate pilfering and quickly decided against it. In other places we would have been confident that the host would appreciate the feedback but in Sicily we assumed it would more likely be viewed as harmless childish behavior and not the violation of trust that it represented for us. We were now participating in the often referenced fatalism of the Sicilians--the fatalism and resulting passivity that keeps the mafia prospering. Bouffant-wrapped Easter eggs were everywhere. Tràpani looked like a yo-yo in our early 2008 itinerary. Bill had selected Tràpani last fall as the hub for our 2007/8 transitions. Tràpani's old military airport (shared with the mafia some years ago) had morphed into a hub for one of the deeply discounted air services that linked Dusseldorf, Germany with Sicily. 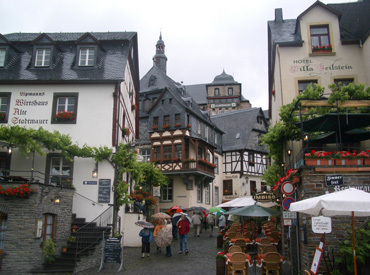 The suburban airport was barely convenient with Tràpani and Dusseldorf was awkwardly positioned with our international airport in Frankfurt, but outrageously low airfares made the extra ground transportation needed at both ends acceptable. So, it was at Tràpani where we stored the bikes over the winter months as we shuttled to and from home via Germany. And Tràpani had the added benefit of being one a few departure points for Tunisia from Sicily, so it was ideal for us. But Tràpani lost our business in March and I'm sure that of many others when the Tunisia ferry route was cancelled for several months. 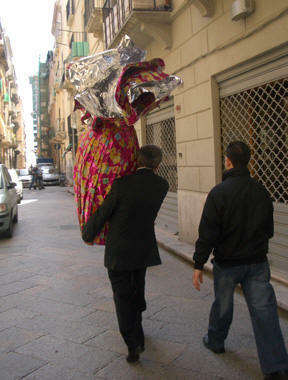 We transferred from the suburban airport to Palermo, bypassing Tràpani, when we arrived back in Sicily in the spring. However, we once again overlooked that Easter was early this year, and familiar Tràpani popped up on the radar as a place where we could easily make reservations to park ourselves for that very busy long holiday week. We hadn't planned on a 10 day layover upon returning from Tunisia, but the 10 day long Easter event settled that matter for us. Bill happily switched his itinerary from traveling to 'mending nets'--so much more interesting sounding than 'doing chores'. The new laptop, 2 new smart phones, and new Vista software were still giving him fits. Everything was working, but barely. The webpage wasn't usable with the new software and Bill had to come up to speed on using his new cell phone purchased to function as a modem for accessing the internet. It was having daily or almost daily access to the internet that would allow our house to be sold while we traveled overseas. By Easter the house was almost ready to go on the market, so Bill needed to deliver on his promises of connectivity or else we'd be making big changes in our travel plans. And, as at the start of every touring season, there was bike maintenance to be done. The unplanned 10 day layover quickly shifted from being a burden to barely being long enough for Bill to mend those many nets. My "to do" list paled in comparison to Bill's. I nabbed the computer when he took breaks so as to work a bit on the webpage, even though it was weeks from being operational. And each day I made the almost 2 hour roundtrip journey to do the marketing. It was a long walk out to the better supermarkets but the combination of greater selection and values and getting my exercise made it worth doing. Unfortunately it was a very un-scenic truck route mostly through industrial park, but being able to walk in sunshine instead of rain in March was a treat. 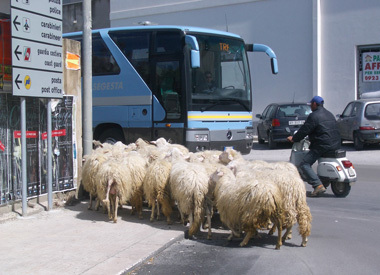 A dangerous intersection near the industrial park market in Tràpani. We held our breathe as we arrived at Tràpani as Tràpani was a higher stakes stay than most--but it wasn't worries about the mafia that were looming largest in our minds. We'd reserved a particular room at a small hotel and had been told it was ours but that same promise hadn't been honored on our previous stay. Though all the rooms are freshly remodeled, some were far too annoying for a week's stay. Some only had windows that opened onto the interior courtyard that collects the cigarette smoke from the front desk staff. Others had knee-knocker toilets that could only be sat upon sideways. We crossed our fingers that this time the more comfortable room would be ours. We would also be awaiting delivery of a package being sent from a German bike shop with $600 worth of tires and panniers we hadn't wanted to haul around with us. We were confident things would go well at the German end of the transaction but were less confident once the package hit the Italian border. Several years ago a package of ours was delayed many weeks because the Italian postal folks put one of their labels over the postage then declared the box as "postage due." We hoped not to be extending our stay in Tràpani day-by-day as we waited for another errant package. And Tràpani would be the site of our second Mediterranean experience of cajoling mechanics to let us use their workbenches to replace hub parts. 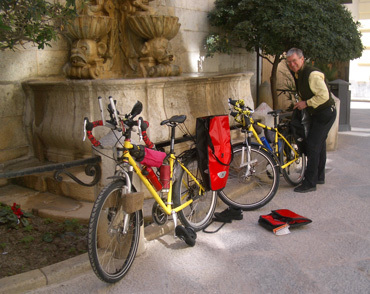 We treaded water in Croatia last summer for several weeks while we waited for a part and a special tool to be sent to us from the States for my defunct bike; this year Bill brought both with him to do the job as scheduled maintenance, rather than an urgent repair. But a hefty vice is too much to carry with us, so we'd be asking to borrow one, plus a basic bike tool (a chain whip). Those were the cliff-hangers for us in Tràpani. In addition, we needed a bit of luck to navigate around the market schedule changes caused by the Easter holiday knowing full well that little information would be posted on store doors, you are supposed to know. Internet access is always a wild card and Bill was counting on the hotel's lobby wifi system for hours of online work while he got his own system up and running. One by one we logged successes instead of failures in Tràpani. Our favorite room was indeed ours, without lodging any protests. Bill was crest-fallen to see that their wifi system that was on the blink in November was now gone. Fortunately, a transmission tower for the mobile phone system he was using to access the internet via cell phone was just a couple of blocks away so he had a strong signal and snappy service from the comfort of our room. "Va bene!" (literally "It goes good.") we sighed with relief when our box from Germany arrived in Tràpani 48 hours after we did. Everything was as promised in the box and we had only just begun to consider our contingency plans should it be delayed. Even replacing the hub part went well, though it was a more involved process. Our hotel clerk directed us to a car tire shop when we asked for a bike mechanic. Predictably, the tire man shook his head "No, he couldn't help us" when we gestured that the problem was inside the hub. After some circling around, we were able to find the bike shop to which he directed us. But of course, the bike mechanic missed the point that we didn't want him to do the work, which he knew he couldn't do, we just wanted his workbench. His friend was keen to have us be accommodated and improved upon my imprecisely pronounced Italian for words like "vice" and "wrench" as he lobbied for us. With his friend's enthusiasm for hospitality, we were invited to use the vice and the mechanic pulled out the needed chain whip to remove the gear cluster from the back wheel. But who would have thought that the mighty vice would be bolted too close to the wall to hold a wheel. After some athletic attempts by Bill and the mechanic to loosen the threaded part with a long handled wrench, the mechanic considered it hopeless. Failure wasn't an option for us however. We explained that we'd go to the 'gommista' or tire specialist to use his vice and then return. Bill's bike minus its rear wheel and all his tools were left at the bike shop as we trundled back to the tire shop. The 'gommista' and his entourage that were chatting on the sidewalk all stared as we approached the shop with the wheel in hand. I spoke with the young gommista again about using his vice and his slight but athletic coworker grabbed the wheel without a word and walked into the shop and plopped it down on the vice. He later explained in Italian that he too was a cyclist and that must have been why he so quickly spotted the nut-like tool lodged in Bill's hub and understood the objective. His vice wasn't anchored strongly enough so again, without a word yet uttered from him, he headed out down the street with the wheel in hand to the nearby auto-electrical shop. Without speaking to the mechanic working there, he slipped the tool with the wheel attached into the vice and again began cranking on the wheel with his might. He was young and strong but short and of slight build and hub didn't yield. Fortunately Bill's prior experience with my wheel made it easy to remember the manufacturers advice, which was to put 2 people on the wheel and give the wheel a snappy jerk against the vice. Bill called me into position as he'd done once before and on the count of 3 we were able to crack the grip between the threads. Sweating bullets at having other people set the tempo for the repair, Bill quickly pulled out the new hub piece and with the mechanic's eager help seated it. Only when outside this second auto shop did the mechanic speak to us, in Italian. We was curious as to our nationality, presuming of course that we were German, and wondering if we were touring together. He shared that he was a cyclist, but not mountain bikes, which he naturally inferred from our mountain bike wheel and tire, all he'd seen of our bikes. After slightly greasy handshakes and smiles, it was back to the bike shop to finish up the job and put the wheel back on the bike. The outing had started with trepidation, not knowing if we'd find a bike shop and if they'd be accommodating, but ended with success. Everyone had been kind and helpful and all involved declined payment for their assistance. Even given the kindness and the success, we hope not to have to stress our Italian and our good luck this much again in an overseas bike shop. Bill's wind-sheltered bike workshop near our Tràpani hotel. Bill spent the better part of 3 days renovating our bikes with new parts while in Tràpani. The Phil Wood "hub guts" and ratchet ring on Bill's rear wheel were replaced at the bike and 'gommista' shops as had been done on my bike in Croatia last fall. 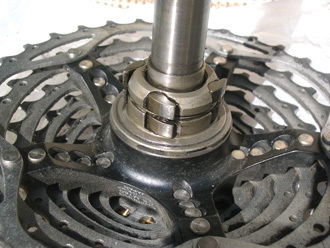 In addition, the more external bearings were repacked on both bikes. Brake and gear shifter cables were also replaced--those are cables that can break on the road so Bill always replaces them a little earlier than recommended. The heavy new chains we brought from home weren't needed yet, so they would be stashed in the bottom of our panniers for another 600 miles before replacing. Disk brake pads were inspected and replaced as needed and new handlebar wrap was put on both bikes. My bike received a new tail light as the fitting on the previous one was damaged in transit at the beginning of 2007 and I had been limping along with a hefty application of electrical tape since then. All bolts on the bikes and racks were snugged-up to prevent things from unexpectedly falling off as we sail down the road. Bill got new shifters and our extravagant $75 tires mailed to us in Tràpani from Germany were now ready to rub their expensive noses in the dirt. 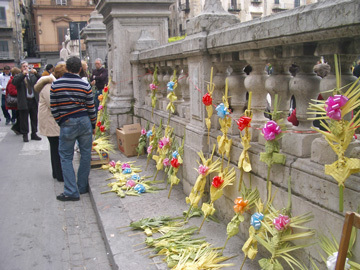 Palm Sunday vendor wares near Palermo's Cathedral. 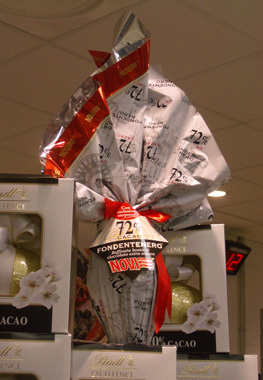 'Semana Santa" I believe was the Spanish term; in Italian it is 'Pasqua'; in English it is Easter. In the States, Easter is a one day holiday, or for some a 3 day event with Good Friday. But in countries where there is less separation of church and state, Easter is a 10 day event. It was fear of lodging difficulties that had us 'holing up' in Tràpani for a week. We stayed put in Palermo while Palm Sunday blew over, not wanting to be vying for public transportation with the locals as we took the train from Palermo to Tràpani, then we parked in Tràpani until Pasquetta or "Easter Monday." I'd hoped to see a grand procession heading out of Palermo's cathedral on Palm Sunday, so we carefully read the posters glued to telephone poles and bill board spaces. Several Palermo churches had processional routes listed, but we had trouble locating the churches themselves. Surprisingly, tourist info was of little help in planning our event. So on Palm Sunday morning we trotted down to the cathedral and waited and waited. The schedule was an interpretation of the activities, not something to be followed too closely. Finally, the indoor service moved outdoors to the temporary stage and we watched with what seemed a meager crowd for such a big event. Palm Sunday procession crossing the street to the Cathedral. Finally, the robed men were heading out and we were ready with our camera to document the procession as it moved through Palermo's main streets with much pageantry. The police held the traffic as the solemn processioners and a few church-goers passed through the arcade across the street. We darted ahead on the adjacent main street, expecting them to emerge from the courtyards, but missed them. Dumbfounded, we ran back to the church and boldly entered the more private arcaded area, hoping to retrace their route. Inexplicably, the procession had disbanded in the courtyard. We spotted some of the robes draped on hangers inside one grand room and noticed them over the arms of people leaving. Despite a turn-by-turn processional route through the city streets being posted around town--it didn't happen and we had no idea why. 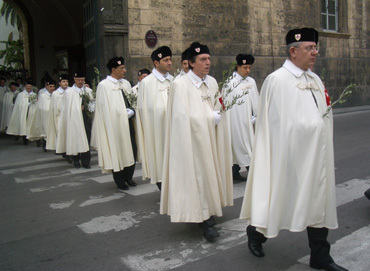 It was like being a kid at Easter without an Easter egg--I'd missed my 'candy'--my first-ever Palm Sunday procession. Observing the procession had become my consolation prize for hanging out in Palermo over the holiday week-end before settling in at Tràpani and it didn't happen. This was the biggest Easter egg we spotted. Our time in Tràpani had quickly disappeared as so many of the Easter goodies also must have while we were there. Overhauling the bikes had been completed, but little else was as far along as we'd hoped after a week's stay. Bill was still tearing his hair over problems with the new webpage software and had abandoned his hopes of getting the webpage fully functional any time soon. Instead, Bill was settling for "intermediate solutions," like having the current webpage files being accessible and nothing else. 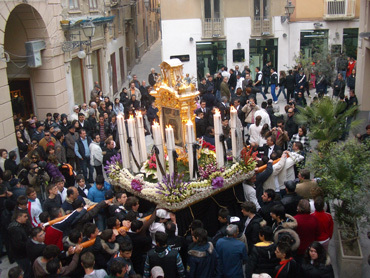 Tràpani's Easter procession from our hotel window. The excellent help he'd gotten in Palermo was just sufficient to access the internet via his new cell phone--sufficient enough to discover the next layer of problems to be solved. Our several planned day rides around Tràpani had been squeezed off the calendar by electronics-related problems and I would soon pay dearly for the deconditioning effects of no biking for over 6 weeks. But despite what was still left undone from this bonus 10-day layover, it was time to move on. There is always more to do no matter how much you do so we'd launch our biking season with slightly shorter riding days hoping to soon wrap up the loose ends while on tour. After much deliberation, Bill abandoned his plans for visiting Sardinia this year and instead decided to spend the time traveling along Sicily's southern coast. The lack of ferry service from Catania to Sardinia tipped the balance so we've turned the corner from the eastern end of the island and now are heading northwest. Suddenly being at the most southern part of Sicily in late May has resulted in some mid-80 degree riding days, which is taking its toll on us. We're definitely not heat acclimated and now savor the cooling winds that have accompanied our journey around Sicily. We're hoping the temperature doesn't climb any higher before we make our way back to Palermo or Tràpani for a boat ride north, perhaps to Marseille.